The planet Venus has erupted into view in the easternmorning sky during the past couple of weeks. When September opened, this resplendent Morning Star wasrising just after dawn's first glow at around 5 a.m. local daylight time. Butwith each passing morning, Venus has been rising ever higher and has beengetting a little brighter. 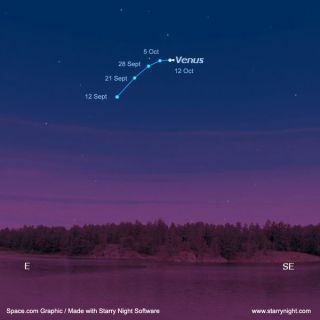 Try looking for Venus through the brilliance of the daytimesky. It can be done if you know exactly where to look. Those who live in ruralareas far from any extraneous light have reported that Venus can cast a faint,yet distinct shadow. Probably the best method is to simply keep it in view untilafter the sun comes up. At its current extreme brightness, it can often beperceived as a tiny white speck against the blue backdrop of daylight. And by month's end, it's rising at around 3:30 a.m. and willprecede the sun by some three and a half hours. Venus was at inferiorconjunction on Aug. 18, in line between the Earth and the sun. Now it isswinging away from that line, speeding ahead of the Earth in its faster orbit. Soin a telescopeduring September, it displays a large, brilliant, beautiful crescent that waxesin phase all month while shrinking in size. When September opened,Venus was only 8-percent illuminated, but by month's end, that figure will haveincreased to 33 percent. But because it will have receded 16 million miles fromEarth, the planet will appear more than one-third smaller than it did at thestart of the month. Thoughts of viewing thecrescent of Venus reminds me of an amusing story related by George Lovi (1939-1993),a well-known astronomy lecturer and author who was also a good friend of mine. One night, while runninga public night at the Brooklyn College Observatory in New York, the telescope was pointed right at Venuswhich was then displaying its delicate crescent shape. Yet one student gazingthrough the telescope eyepiece stubbornly insisted he was not looking at Venus,but at the moon instead. When George commented that the moon wasn't even in thesky, the student replied, "So what? Doesn't a telescope show you things youcan't see without it?" During the coming weeks, Venus will also be floating ever closerto the bright star, Regulus and the planet Saturn, its evening partners from July.By the end of this month, Venus and Regulus will be separated by about 7 degreesand Venus and Saturn by 10 degrees (your clenched fist held at arm's length measuresroughly ten degrees in width). Come early in October, this trio – and a lovely crescent moon– will make for some eye-catching configurations in our predawn sky.